Something major happened at Concordia University this week. On Wednesday, a letter was sent to the university and several media outlets that threatened to detonate bombs near Muslim prayer spaces if the school did not ban Muslim activities on campus. It was a tense day. The letter was sent just before 10 a.m., and police arrived on scene shortly afterwards. At around 11:30 a.m., the school began an evacuation of the Hall, EV, and GM buildings on the downtown campus. Guy-Concordia metro was briefly shut down around noon. Chris Mota, the university’s spokesperson spoke to the media soon after. A few hours later, Concordia President Alan Shepard and Minister of Education Hélène David held their own conference in front of the evacuated EV building. By 6 p.m., the buildings were reopened, and students were heading back to their classes. The following morning, police arrested a suspect who has now been charged in connection with the bomb threats. It’s a pretty exceptional situation, for sure—and one that we hope stays exceptional. 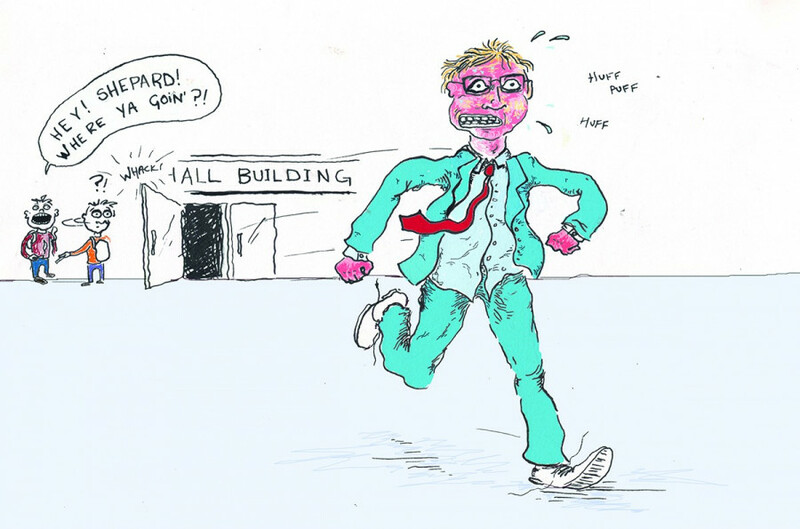 Some disarray is inevitable when buildings have to be evacuated on short notice under duress. We recognize that. But we also think that Concordia’s response was inadequate—and if the bomb threat had been real, it could have cost lives. By the time the buildings were empty, the bomb threat had already been out for over an hour and a half. The sender threatened to detonate explosives shortly after noon, but the building still should have been evacuated immediately. When the evacuation actually happened, there were no clear efforts to organize the crowds that amassed outside the buildings. Several Link reporters were on campus trying to figure out what was going on. It soon became clear that no perimeter was set up around the targeted buildings. Students still lined up along the big glass windows in front of the Hall building, waiting for the shuttle bus to Loyola. There’s more decorum for fire drills, where students are made to cross the street away from the building. The letter also stated that the bombs would detonate anytime between noon on Wednesday and Friday. Yet the university insisted on sending students back to class on the day the threat was issued. This was a horrendous decision, potentially putting multiple lives in danger, and the mental health and physical safety of the Muslim student population at risk. Not only could this leave students in a state of fear of dying at any given moment, but how on earth did the Concordia administration think students would be able to simply carry on with their exams with a bomb threat is hanging over their heads? Something else to take note of was the police presence on the scene, or more specifically its scarcity. With an extensive number of students being evacuated under highly urgent circumstances all at once, you’d think there would be more hands on deck to help get everyone to safety. Ironically, you’d have a better chance at seeing multiple police officers at a student protest, ready with their pepper spray if anything got too rowdy for their liking. On Wednesday night, the Concordia Student Union sent an open letter to the university administration asking them to grant academic amnesty for all students from Wednesday to Friday, the period that the threats specified. Academic amnesty means that no marks would count for those days and that there would be no penalization for not attending class. The university responded the next day and said that appropriate accommodations would be made for students that had classes disrupted the day of the initial threat. They did not apologize for reopening school the night of, but they said there was legitimate confusion as to whether operations were restarting again or not. The Link believes this retroactive gesture wasn’t enough. Even though Montreal police declared that no suspicious or explosive items were found, the effects that such a threat has on the mental health of students, most importantly for Muslim students, was cause enough to enforce academic amnesty for those three days. Like the CSU, we call on the Concordia administration to retroactively implement academic amnesty and apologize for reopening the university the night when the threats first emerged.